1 of 3 Sprinkle tilapia with 3/4 tablespoon of the ginger and 1/4 teaspoon each of the salt and pepper. Heat 1 tablespoon of the oil in a large nonstick skillet over medium-high heat. 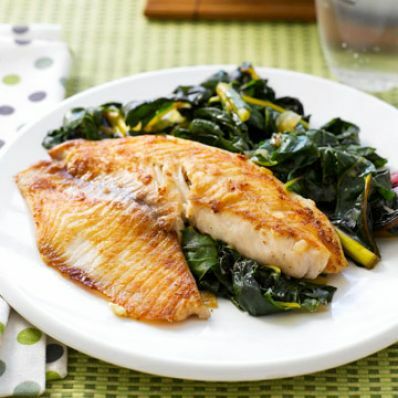 Cook tilapia 2 to 3 minutes per side or until fish flakes easily. Remove from skillet and keep warm. 2 of 3 Heat remaining 1/2 tablespoon oil in skillet; cook onion and remaining 3/4 tablespoon ginger for 1 minute. 3 of 3 Increase heat to high. Add Swiss chard, remaining 1/4 teaspoon each salt and pepper, chicken broth and wine to skillet. Cook 3 minutes, stirring, until chard is wilted. Per Serving: 2 g sat. fat, 3 g carb., 35 g pro., 85 mg chol., 0 null Mark as Free Exchange, 8 g Fat, total, 533 mg sodium, 1 g fiber, 233 kcal cal.